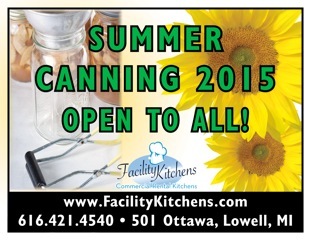 Personal Canning: July 7, Tuesday afternoon, at Facility Kitchens. We start at 3:30pm and run about 4.5 hours, $30.00 - payment at the door. Reservation: janet@facility.kitchens.com. This week you choose beans or pickles. If you choose to do pickles, your session will be a multi-day process. You bring your ingredients, spices, jars, and knives. Questions? Call 616.421.4540 or email janet@facilitykitchens.com. If you are new to canning, no problem.